Home » ios » How to Play FLV on iPhone 5S/5C/5/4S/4/3GS/3G? Though FLV is viewable on most operating systems including Linux, Android and Microsoft Windows, FLV is still cannot supported by Apple's iOS which is an operating system for iPhone, iPad, iPod Touch, and Apple TV. That is to say, we still cannot play FLV on iPhone/iPod/iPad/Apple TV, and the new released iPhone 5 will be no exception. 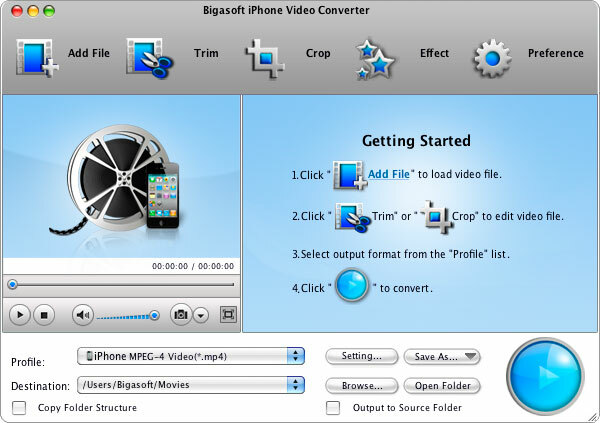 Bigasoft iPhone Video Converter, the professional FLV to iPhone 4S Converter as well as FLV to iPhone 5 Converter, is specially designed for iOS based devices like iPhone/iPad/iPod/Apple TV. It can easily convert FLV to MPEG-4/H.264/MOV for play FLV on iPhone 4S/4/3GS/3G, play FLV on iPhone 5, play FLV on iPad/iPad 2/iPad 3, play FLV on iPod Touch/Shuffle/Nano/Mini/Classic, and play FLV on Apple TV/Apple TV 2/Apple TV 3. Besides, it also can convert other video formats including F4V, AVI, MPEG, MKV, WMV, WTV, 3GP, ASF, MTS, VOB, RM, RMVB, TS, MVI and more to iPhone 5S, iPhone 5C, iPhone 5, iPhone 4S, iPhone, iPad, iPod. Moreover, it even can convert audio files including WMA, OGG, FLAC, MP2, AC3, RA, M4B, AAC, CAF to MP3/AIFF/WAV/M4A for play various audio on iPod/iPhone/iPad. Free download the professional FLV to iPhone 4S Converter - Bigasoft iPhone Video Converter (for Windows, for Mac), install and run it, the following interface will pop up. Click "Add File" button to import FLV video file. 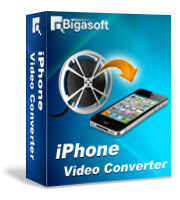 Or you can also drag your FLV file directly to the main interface of Bigasoft iPhone Video Converter. Click the drop-down button on the right side of the "Profile" to select iPhone 4S supported iPhone MPEG-4 Video (*.mp4) from the "iPhone" category. This format is also supported by iPhone 5/4/3GS/3G. To play FLV on iPad/iPad 2/iPad 3, select iPad MPEG-4 Video (*.mp4) from the "iPad" category. To play FLV on iPod Classic/Nano/Nano 7/Touch/Touch 4/Touch 5/Shuffle, select iPod MPEG-4 Video (*.mp4) from the "iPod" category. To play FLV on Apple TV/TV 2/TV 3, select Apple TV MPEG-4 Video (*.mp4) from the "Apple TV" category. To play HD FLV on any of the above devices, select HD H.264/MPEG-4 AVC Video (*.mp4) from the "HD Video" category. Click "Convert" button to finish the FLV to iPhone 4S conversion. Start iTunes and connect iPhone 4S to computer, and then import the converted FLV to iTunes for syncing to iPhone 4S just as you import and sync your other videos to iPhone 4S.